South of Akureyri is Iceland's most visited forest Kjarnaskogur. The recreational area is approx 600ha with more than 1 million trees of many species planted within the last 50 years. The area has7 km lighted trail in addition to a vast network of backcountry trails. Also there is a 10km long designated mountain bike trail. There are two playgrounds, picnic areas, barbequ facilities, restrooms and a volley ball course as well. For bird lovers, the area has a very varied bird life, and even a bird watching shelter by the marsh Hundatjörn in Naustaborgir. Campsite at nearby Hamrar with easy access to the forest. This is an attractive wooded area with possibilities for a variety of recreational activities. The area is owned by Akureyri Municipal Council but is under the guardianship of the Eyjafjörður Forestry Commission. To get to Kjarnaskógur, take bus number 1,3 or 4 and go out at Kjarnagata/Vallatún. From there is about two km. walk to forest Kjarnaskógur. It´s also possible to take taxi. 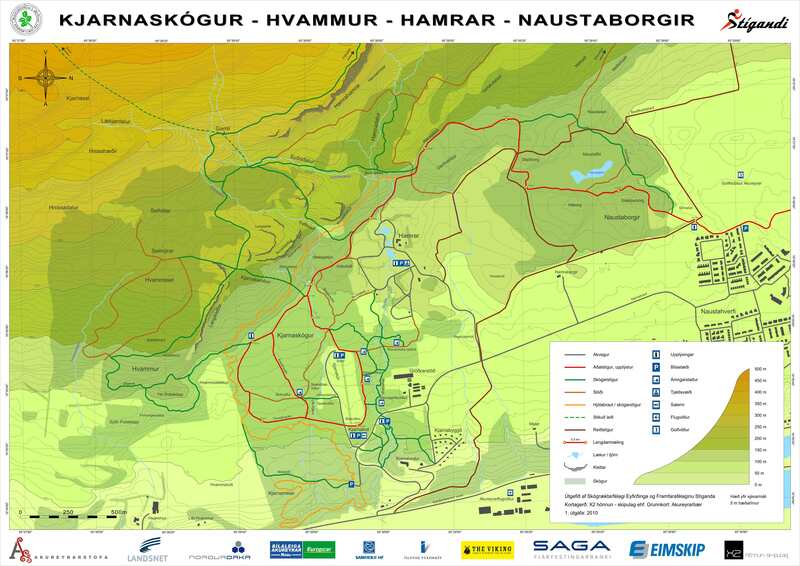 Map of hiking routes in Kjarnaskógur Woods.